Merville Gun Battery Terrain Expansion brings an exciting new aspect of hardened, defensive battles to SMG. 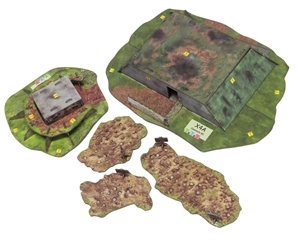 Each can be surrounded with all new Minefield Terrain pieces for even more defensive protection. Crossing these treacherous fields will test the will of even the bravest soldier during the assault. 6 new scenarios featuring Red Devils and Operation Tonga will certainly be a test for any SMG fan!